The headline writers are going wild. Arutz Sheva says, “Dig Supports Biblical Account of King Solomon’s Construction” here. The article includes a short video featuring Dr. Eilat Mazar at the site here. The Associated Press article is headed “Archaeologist Sees Proof For Bible In Ancient Wall” here. 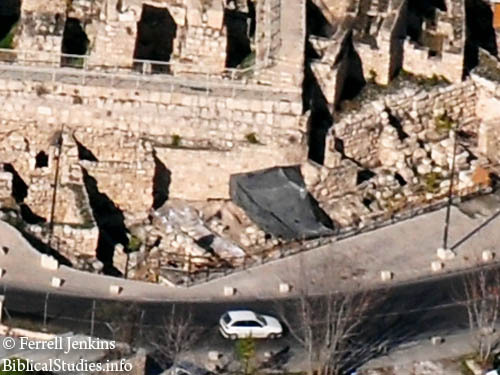 The AP headline at Yahoo News reads, “Archaeologist sees proof for Bible in ancient wall,” here. The news release from the Israel Ministry of Foreign Affairs reads, “Jerusalem city wall from 10th century B.C.E. uncovered,” here. Dr. Eilat Mazar, of Hebrew University, has been working for several years in the City of David excavation. For the past three months she has been working in the area north of the City of David next to the street that runs along the south side of the Temple Mount. The area is part of what is called the Ophel. Eilat Mazar worked here with her grandfather, Benjamin Mazar, in the 1980s. You can see the area in this aerial photo I made December 15, 2009. In fact, a portion of the excavation is covered by a tarp. 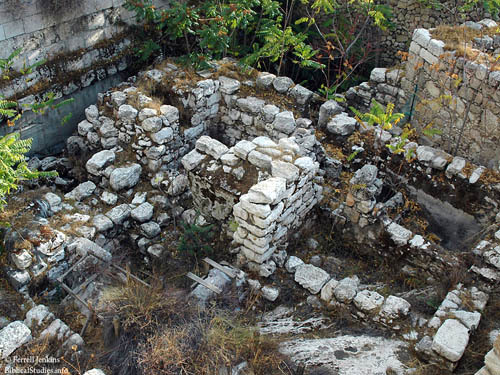 Aerial view of Second Temple excavation. Photo by Ferrell Jenkins. Thirteen photos are posted on the Hebrew University Facebook album here. Todd Bolen (here and here and here) and Leen Ritmeyer (here and here) point out that, in spite of the news release, this excavation goes back many years. Dr. Eilat Mazar has spent the past three months working in the area. Below is a photo of the gate area showing the west chambers that I made in 2005. Benjamin Mazar and his grand daughter Eilat published a report on this area in 1989. Gate from First Temple Period. Photo by Ferrell Jenkins 2005. Compare the photo above, and the schematic drawing on the sign below (from 2005), with photos 12 and 13 in the HU Facebook album. Marker indicated First Temple Period gate. Photo by Ferrell Jenkins 2005. I look forward to seeing the area that has been recently cleaned. The news reports, including the video by Prof. Mazar, do not distinguish between what we already knew and what is new. No one would enjoy seeing an inscription reading “Built in the 950 B.C. by King Solomon, son of David” more than I. Until more evidence is forthcoming we must leave Solomon out of this picture. P.S. I was about 5 minutes away from posting this early today when my wife came to say that we must leave to pick up our grandson for the day. I chose the better part! This entry was posted in Archaeology, Bible Places, Israel, Old Testament, Photography and tagged Jerusalem. Bookmark the permalink.